Finally, Club Nintendo has expanded its repertoire of rewards to include merchandise for The Legend of Zelda series. For 350 coins, you can grab your very own Legend of Zelda three-poster series. 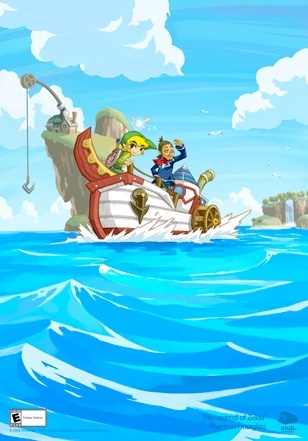 The first two posters are promotional art for Twilight Princess and Phantom Hourglass (pictured left) respectively, but the third is a special ‘History of Link’ poster, showing the numerous incarnations of Link throughout the series. These posters are quite awesome, so if you can survive waiting four to six weeks for delivery head over to Club Nintendo and redeem your coins. Unfortunately, these are only available from the American Club Nintendo for now. Just maybe, if these posters go well, we’ll see a lot more Zelda merchandise in all of the world’s Club Nintendos. Hopefully this means we’ll see less Mario merchandise. If you missed it the first time, you can find the posters here. Update: These posters are sure selling better than Nintendo expected. Numerous people have reported that their orders are backordered. I hope Nintendo has learned from this, and realizes that we want more Zelda merchandise.